Posted By:Unknown | At:12:26 PM Be the first to comment! 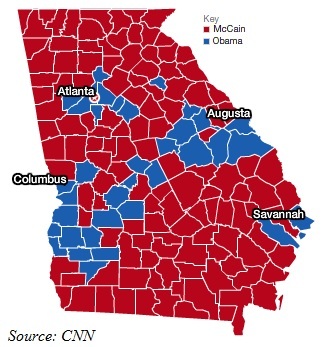 (AJC) --- With Georgia once again a safe haven for the Republican presidential candidate, Democrats here gaze longingly at North Carolina and Virginia and wonder: Why can’t that be us? Now, just weeks from the Nov. 6 general election, Virginia and North Carolina are again in play while Georgia has been little more than a drive-through bank for both sides. To understand why, Georgia Democrats need look no further than their inability to attract white voters. In Obama’s first bid for the White House he received just 23 percent of the white vote here, compared to 39 percent in Virginia and 34 percent in North Carolina, according to exit polls. As of last week, Obama had the support of just 22 percent of Georgia’s likely white voters, according to a poll conducted for The Atlanta Journal-Constitution and released Sunday. Political analysts cite several factors as explanations for the difference: demographics, culture and organization. The demographic calculus centers primarily on education. Non-Hispanic whites in North Carolina and (especially) in Virginia are more likely to have college degrees than their peers in Georgia, according to census figures. Both Virginia and North Carolina have large pockets of highly educated, socially liberal white voters with strong connections to government, and they tend to vote Democratic. In Virginia they cluster in the D.C. suburbs of northern Virginia and in the Tidelands; in North Carolina they’re concentrated in the university-rich Research Triangle of Raleigh-Durham-Chapel Hill. Whites in Virginia also enjoy a considerably higher average household income than in Georgia, although North Carolina lags both.